The Moment Camera Lenses attach to the back of your iPhone via a mounting plate and come in a couple different options depending on what type of photography or cinematography you are interested in. 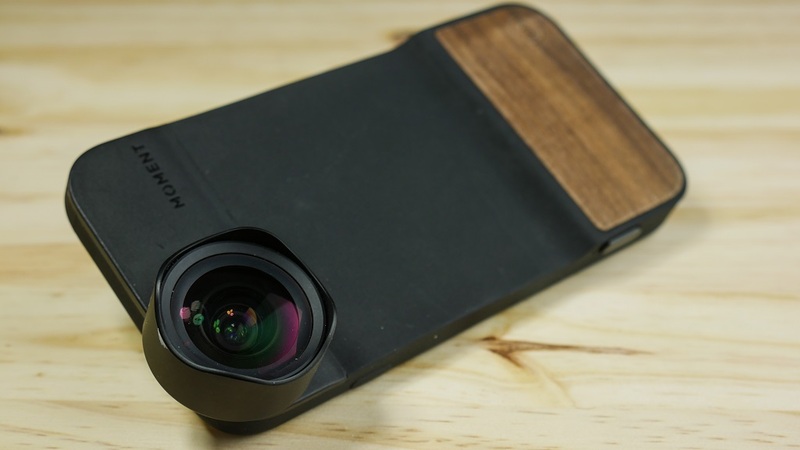 This Moment Lens and Case Review will go over the different options for lenses, cases and other accessories as well as a thorough review of the Moment Wide Lens and the Walnut Case. Moment is a small lens and accessory company that launched on Kickstarter back in Jan 2014. They raised over $450,000 with 4722 backers in less than a month and began shipping units out about 4-5 months later. By October 10th, 2014, Moment successfully shipped out the every backers order. Since the campaign Moment has continued to grow and add different products/accessories to their store. The Lenses attach to the back of the iPhone via a thin mounting plate or Moment case. All of the lenses are easily swappable just like a DSLR and come with an convenient carrying bag to keep the lenses safe. The Moment Lenses come in three different styles; Wide Lens, Tele Lens, and Macro Lens. The Wide lens will capture 2x more landscape, the Tele Lens will get you 2x as close and the Macro Lens will get you 10x closer! Each of the lenses retail for $99 and you can pick them up at www.momentlens.co/shop/. The Moment lenses and cases are only available for the iPhone 6, 6S, 6 Plus and 6S Plus. You can also pick up the Moment Case which is what I recommend if you don’t already have a case. The Moment cases come in three different styles; Black ($49.99), Walnut ($69.99) and White ($49.99). I have the Walnut case and I really like the texture. The buttons work nicely, the edges are soft to break falls and the bottom of the case doesn’t cover the charging port or the headphone port. The Moment cases are the easiest and cleanest looking option for the mounting the Moment lens. You can still use your own case over the thin mounting plate but It’s a pain having to remove the case every time you want to attach the lens. With the Moment Case, the lens will just rotate into place without having to remove anything or applying mounting plates. Moment also has their own app which allows you to full customize your photo experience. With the APP, you can use simple gestures to change the exposure, set multiple focus points, set up an auto timer and take TIFF photos. You can even connect your case to your phone via bluetooth to take photos with the cases shutter button. If you’re a believer in the Moment slogan that the “Future of Photography is in your pocket” then I’m pretty sure that you will absolutely love the Moment lens and Cases. They are easy to attach, easy to remove and add an entirely new level to your iPhone photography. The Lenses aren’t exactly the most convienent thing to carry around in your jean pockets but they store easily in a purse, backpack, fanny pack, etc… I don’t really find myself taking the Moment Lenses with me all the time but I will definitely bring it if I know I’m going to be doing something picture worthy.